Home » Are your Gears Grinding: Hip Flexor Pain or Hip Impingement? Do you have hip flexor pain or a hip impingement? Impingement occurs when two bones are not sliding on their normal axes and pinch together. Picture two gears that are spinning nicely without friction. This is the way your hip joint should work. 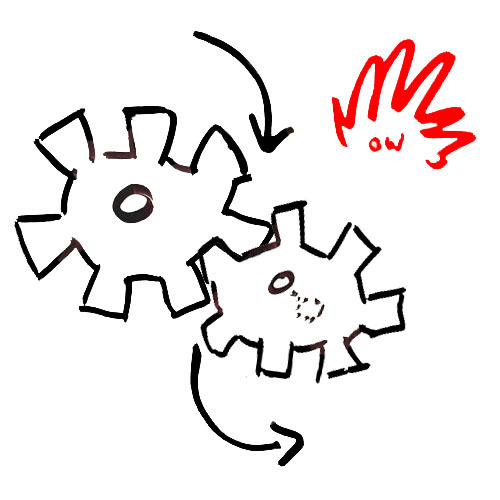 Now, imagine that one gear is nudged the slightest bit closer to the other gear. 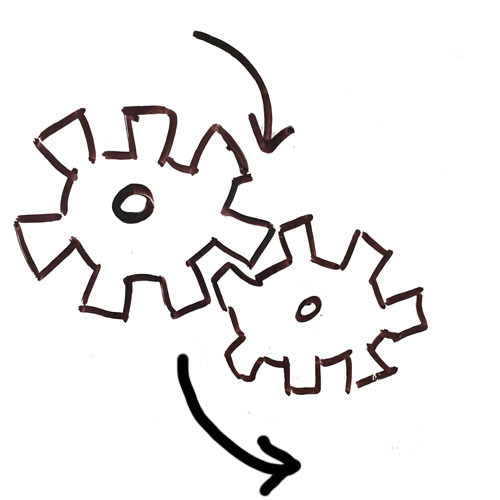 Can you see how the gears will have more friction between them, moving less smoothly, potentially clunking, as one gear passes the other? This is what occurs in a hip impingement. Due to prolonged sitting over years and excess training overusing the quads and underusing the gluteal tissue and hamstring, the posterior hip capsular and adductor magnus become overworked and develop adhesion. When these tissues are tight, they pull the head of the femur forward in the socket, causing a “pinching” sensation in the front of the joint. How do you know if you have a hip impingement? Your pain or stretching will only be present at the end range of hip flexion, either in a squat or passively when lying face up. If you’re not sure, you can stand up and squat now or have someone check your thigh to chest test. 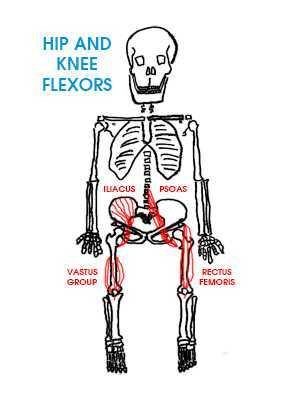 What is hip flexor pain? How do you know which hip flexor pathology you have? The key differentiator in hip flexor pain vs. hip impingement is at what range the symptoms are provoked. Impingement: felt at end range hip flexion i.e. squat or the thigh to chest test. Hip Flexor Adhesion: felt at end range hip extension or the lunge stretch test. Hip Flexor Strain or Tear: can be felt at any range, but differentiated by the above two by being symptomatic at neutral i.e. standing and lifting the hip a little as you would when walking. A hernia occurs when your intestines come out through a wall of muscle, usually your abdominal/core muscles. You will be a soft mass in the location of the pain. The lump can go away when you press on it or lie down. The hip flexor pathologies or hip impingements will not have a mass present. If you think you have a hernia, surgery is your primary solution and exercise/strengthening is your secondary solution only after surgery is performed. How do you fix hip flexor pain or an impingement? As always, all of the above conditions are caused by overload, or too much water in the damaged tissue’s bucket. In order of severity, hip flexor pain starts as tight muscles that the body conserves energy from by laying down adhesion (A). 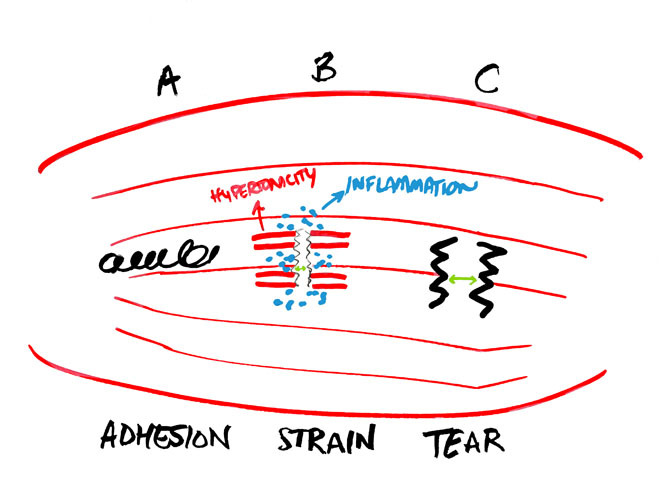 Adhesion is present over months to years before there ever is a more significant pathology. Eventually, an individual does something that uses the hip flexors more (i.e. sprinting after not doing so in months/years) and either strains (small overload – B) or tears (larger overload – C) the tissue. Notice the distance of the canyon in B. The body can cross small chasms and repair them. Notice the distance of the canyon in C. Only if the tear is significant and the body cannot traverse the canyon-sized ravine is surgery required for a tear. In all of the above cases, removing the adhesion from the psoas, iliacus, or rectus femoris with manual adhesion release is the sweet-spot solution. If there is a strain or acute tear, then inflammation is present and time is required in addition to deloading (not using) the muscles. In hip impingements, the adhesion needs to be removed in the adductor magnus and posterior hip capsule. If an individual has been active from adolescent years, especially hockey, basketball, or soccer, or has been involved in significant loading of the hip joint over years, then a CAM/Pincer malformation is a possibility to contribute to the symptoms. In these instances, extra bone has been laid down as a protective mechanism (this is a form of Osteoarthritis) and pinches the labrum and articular cartilage. Clinical relevance of a CAM/Pincer malformation can only be determined after adhesion has been removed from the adductor magnus and hip capsule. See this case study to learn how we resolved Sari’s hip impingements 95%. Does Impingement Lead to Fast Progression of Hip Osteoarthritis? Especially if you have a CAM malformation or reduced hip internal rotation. Therefore, as soon as hip flexor pain presents itself, it is best to address it early. Tell us about your hip flexor pain? Who have you seen? Did it work? How long have you had this problem? What causes it to get worse or better? If you know of a friend or family member with hip flexor pain or a hip impingement, please forward this information to them so they can get the help they need. Fixing your adhesion matters because it improves flexibility, improves function, reduces pain, and restores normal movement to the body so you can enjoy the things you love. Call us at 862.205.4847. Hi Pamela, I’m so sorry for your pain and suffering. You’re not alone. I’ve been there. Have you had an arthogram of the hip? That would be helpful. Who is managing all of this pain? Injections get rid of your pain short-term. Injections do not fix any problems you have. Where do you live? Pamela Yesner’s condition sounds identical to mine. I had an MRA recently and it indicated superior and anterior Pinsing…There is milld Sub chondral sclerosis.. Hyper trophied superior and anterior labrum. Degenerative cartilage. The unfortunate part is that my left and good hip is starting to mimic the same symptoms and I am in excruciating pain morning noon and night. In the car sitting is unbearable and hitting a bump causes instability/pain in the hip. My mood has changed and I’m depressed. I am due to have surgery for labral tear but truly believe that both hips are in trouble due to extremely tight tendons which are causing tilted hips. I don’t know which surgery is the right option at this point and I am due to see my orthopedic doctor on March 14. I don’t make it that long. Thank you for your time. Hi Tracy, I’m so sorry for your suffering. First, it sounds like surgery is part of the solution. I’m glad you’re pursuing that option. Not knowing your age, activity level, or history of activity/trauma, if you haven’t tested your hip ranges of motion or had a skilled “adhesion” specialist look at your muscles, I highly recommend doing so. Google “Barefoot Rehab thigh to chest test” and “barefoot rehab lunge stretch test”. If you want to report your numbers here, I can talk you through this. Thank you for this article — it’s the most informative one I’ve found! After reading your comparisons, I believe I have a low to moderate strain of the left hop flexor. I can easily pull my knee to my chest, but it is very painful to walk on it when it extends backwards. I started doing nightly 30 minute yoga stretches in hopes of alleviating the pain and it seems to help tremendously. I can walk the next day with just a slight limp which is more preventative than because of sharp pain. I’m hoping that a month without running and doing yoga stretching will help it repair itself. Thank you for the clarification! Thanks for this, it’s very much helpful. I have learnt that training our body is very much enough in order to keep us in good health, both physically and emotionally. But we don’t actually realise the danger hidden within our bodies “hip flexors”, which are very much vital for us and play the role of controlling balance, ability to sit, stand and several other activities. It eventually results in digestive problems, circulatory issues, etc. I realised this lately and found out a solution. I followed Mike Westerdal’s training series to loosen my hip flexors. His ten moves really helped me a lot by exactly targeting the hard-to-reach muscles with clear demonstration. I suggest to try this: https://bit.ly/2TrZOcG . Trust me, its worth it. Glad that it helped you Sarah! My dad has osteoarthritis (almost bone on bone) but we think it was caused by an issue with his hip flexor. He told me years ago he injured or strained his hip flexor and had pain and really reduced flexibility. When bending over to tie his shoes he struggled to reach because of his hip area. being so tight. He’s only 55 and we are being told he will need a hip replacement but that it’s not good to get it too young. Even though his joint has progressed badly now, and he may eventually need a hip replacement he says a lot or maybe even most of the time the pain is coming from his hip flexor muscle that is near the groin area. Should he be addressing his muscles as well? Should they be addressed first? My dad suffered a head injury in 93′ and could never do things that he did before, the only kind of work he’d be capable of is light labor/janitorial type work. But he was never down because he always loved being active and didn’t mind walking/busing everywhere instead of driving. He loves being athletic. And since his hip has gotten bad he’s just not in the best place because he can’t be as independent and mobile. Hi Christina – I always recommend people get adhesion treatment first. Why? If it works, guess what. No hip replace ment! At least right now. Even if he does get surgery, the adhesion work will help him feel way younger and healthier. Make sure he’s seeing competent doctors who can make sure his symptoms aren’t a disc as well. Because groin and anterior hip can be shooting from a disc. I was training for a half marathon about a year go and I began feeling tendonitis of what I thought was my hamstring but I think its my adductor because palpation of the pubic ramus is tender. When I run, everytime I hit 1.5 – 3 miles I feel a pinching sensation in the front of my R hip flexor. This causes me not to lift my R leg so high during running and by the time I hit 4 miles I am barely lifting my foot due to the pinching sensation. I have recently began foam rolling and focusing on stretching my R hip flexors consistently. This feeling has been ongoing for > 1 year. I am going to begin focusing on strengthening my gluts and hamstrings. Other than those interventions, do you have anymore wisdom or thoughts?